We hear ethical debates in the news centered around stem cell research and genetic engineering - some argue that it is corrupt, an act of god or Frankenstein-esque. Advocates see it is an opportunity to eradicate life-threatening diseases and perhaps benefit the environment or help reshape the future. The SQUIDCUT project started two years ago after a BBC Horizon episode featuring synthetic biologist Matthew Jones’ research into the squid’s iridescent colour changing properties. This probed Yipp’s fascination, and a conversation started between artist and scientist that would develop into a body of work with the concept focused on ethical perceptions of synthetic biology - communicated through art, fashion and film. Yipp’s original fashion dress designs are at the centre of the exhibition arranged in a linear formation in the center of the room, like a static representation of a catwalk. The designs are unusual in both pattern cutting and print, the garment silhouettes are inspired by the circular anatomy of the squid, while the overlayed prints are digital manipulations of photographed microscopic squid cells by scientist, Matthew Jones. The connection between both physical structure and digital design of the each garment creates a curious symmetry of lines and fractals unique to each dress yet are ultimately similar to one another just as the example of squid cells shown in another part of the exhibition. Here a series of 12 microscope images of squid cells and garment designs are printed on glass slides with magnifying glass for visitors to analyze. Now you can attempt to connect the dots and pinpoint the various parts of each slide the artist has used to inject into the various elements of her work. As a viewer, we are able to observe the inspiration behind the pattern cutting process, the anatomical squid shapes are abstracted by the artist. For instance; a curved and folded collar, known as a structured wrap neck for a white silk Morocain dress, imitates the recognizable shape of a squids fin. During the earlier stages of Yipp’s process, the scientists lab coat was used as a starting point for pattern cutting, she appears to move on by exploring various types of silks such as bamboo and moracain. The light weight material lends itself to appear like the squid in its aquatic environment, weightless, shimmering and fluid. One piece in particular has resonated with me, Euprymna Black Life Forms, a black silk satin dress printed with the figure of a scientist In a lab coat holding a book enetitled ‘Growing Your Own Lifeforms: DNA circuit design for beginners’. A close up of a squid cell is overlaid on the scientist form in a diamond shape, framing the scientist and book like a halo, centralizing the subject. This very specific design, for me, encompassed all aspects of Yipp’s overarching concept – the polarized opinions of fear and hope associated with synthetic biology at the center, framed by the intricate microscopic squid cells the embodiment of a potential salvation. This piece by Yipp brings us back to the root of the subject and calls the viewer to question their position on the issue. 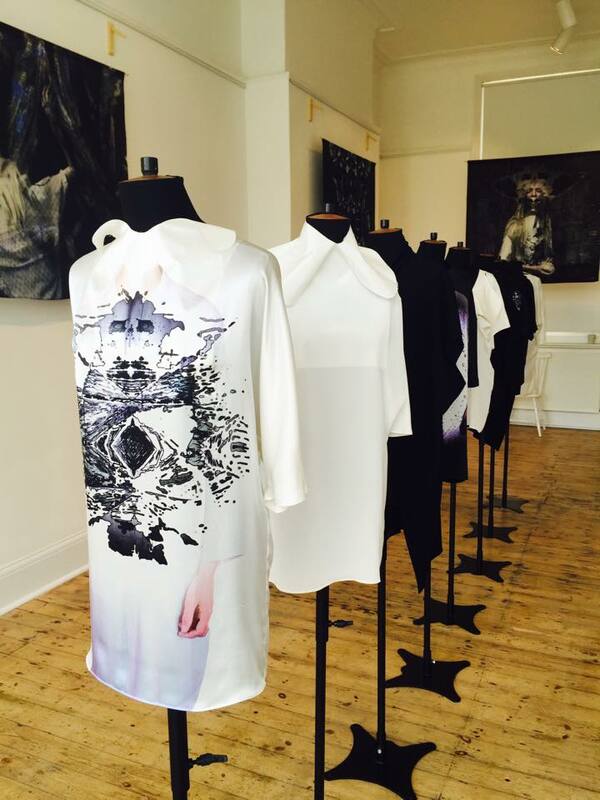 Surrounding the specific fashion component of the exhibition are four large digital prints on silk each are dark and monochromatic, with a model juxtaposed often in pale contrast to the background, wearing one of Yipp’s designs featured in the exhibition. The final result is eerie, like the trademark of the Surrealists, the images are uncanny, an ugly type of beautiful that makes you want to look away yet look even closer. Like the garments, the photographs are combined with the microscopic iridescent squid cells images, which have been digitally manipulated to create intricate patterns and pockets of vivid colour on an otherwise dark and monochromatic composition. They stimulate the brain and keep your eyes wandering around each complex image. SQUIDCUT raised many ethical questions for me, ones that I hadn’t often thought about before. I have often rejected the idea of genetic engineering as it seemed to me, to be playing with a very tiny flame, which could create a global forest fire and send the world into frenzy. However after Lillia Yipp’s show I believe I have reconsidered my position and found myself somewhere on the fence. For an exhibition can make you question your own principles, then I believe their work is done. If your intrigue lies in science and ethics this could be a great visual show for you to see how science and art can come together. Although SQUIDCUT can be considered as a fine art exhibition, I would recommend this show to those whose aesthetic fancies lie in design and fashion. If like me, symmetry, perfect lines and minimalism are what get you going, be prepared to hyperventilate with satisfaction at SQUIDCUT.